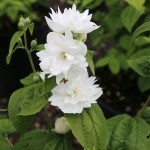 A large, rounded shrub with 2" wide, double, white, fragrant, flowers in the late spring. The flowers contrast well with the dark green foliage. 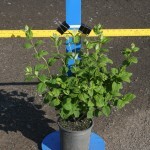 It performs well in dry to moist soils, likes full sun to part shade. Use in a shrub border, and is attractive to butterflies and hummingbirds. The flowers occur on previous year's growth, so prune immediately after flowering if needed.